The new 2015 Motegi Racing rims are now out. 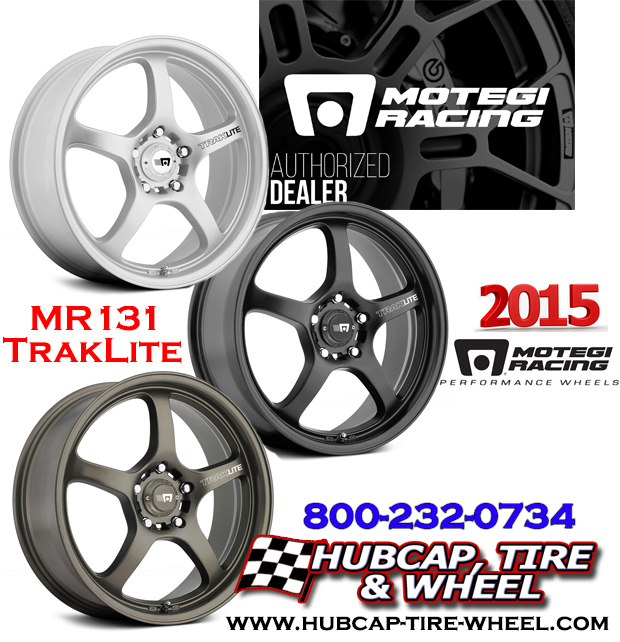 The new addition this year is the MR131 TrakLite wheel. This is a great new addition to the Motegi Racing line. These racing wheels are designed to perform their best under the extreme conditions that are given by enthusiastic drivers with performance cars. These wheels are meant to be driven hard. The design of these rims are very clean. We think they did a great job with the look and feel on the new MR131 wheels. If you have any general questions or questions regarding fitment with Motegi or any other brand, whether it be for tires or fitment on your vehicle, please don’t hesitate to give us a call: 800-232-0734. Our wheel and tire experts have over 70 years of combined experience to help ensure you get the correct fitment. Also, don’t worry, if it doesn’t fit like we say it will, you will get your money back. No hassle guarantee. Corrected: The wheel weight for 17×8 MR131 is 18-19 lbs. Shipping weight is 21.8 lbs. I just checked stock for the black and the silver and they are completely out of stock. In fact, the first shipment of these 2015 wheels are going to be here mid to end of April. Right now they are in transit. That is directly from the Motegi Racing manufacturer so no one has these in stock yet. I would say call (800-232-0734) or message us in a couple weeks and get an update if they came in or not. The 17×8 MR131’s weigh 35.99 lbs a piece?? That was a mistake. It is NOT 35.99 lbs.. that is what is written in our spec sheet from the manufacturer. Shipping weight is 21.8 lbs so take off 2-3 lbs. Your looking at 18-19 lbs per wheel. What is weight on Motegi MR131 17×7 5×114.3?